There are shortages in places no one wants to live. There is a glut of new grad nurses because there are an absurd amount of nursing programs churning out anyone willing to pay tuition. Help your chances by getting a job as a CNA/tech while in school or be willing to relocate after graduation. 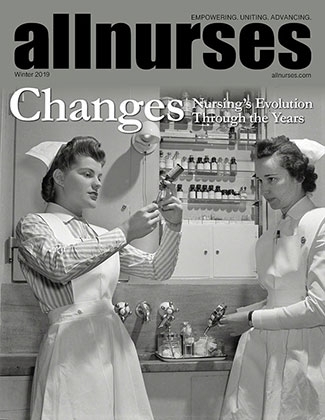 How do people feel about male nurses? This topic belongs in the same fiery pit of hell that the "ED vs. the world" topics belong. I don't see how the OP is trying to "beat the system". She stopped using nicotine, and figured out how long it takes to get out of the system. There have been many posts on this topic in the past. She's not posting about making goldenseal tea or water loading to dilute a test. And really....using drug free and nicotine free interchangably? I'm just sitting back waiting for everyone else to be as annoyed with this ridiculous thread as I am. What are the teaching needs for this patient? 1. Just because you haven't learned it yet doesn't mean it isn't an option. You are going to learn something new every single day of your career. 2. What's your reasoning for encouraging fluid intake in a CHF patient? The only time I've seen a lumen used for one thing only is when a pt is receiving TON and they have a "TPN only" lumen. Red does not mean "blood draws only". Right? I can't think of ONE time we went on divert and it was when there were (quite literally) more dead bodies than beds/live bodies. We don't divert for anything. Just have to say that is a ridiculously dumb policy and a waste of time. But really....it's a 24 hour job. Did you die having to start one on the floor? I don't work ED, but it takes extreme extreme extreme circumstances to go on divert where I am (inner city level 1). Probably because the hospital gets fined for going on divert. Either way, that isn't the nurse's call. I do agree with the "stop enabling incompetent staff" comment, though. But that pertains to all departments. Excuses for laziness/lack of critical thinking of everywhere. I think it is apart of responsible pt care to hold each other accountable. You're expecting way too much. The ED isn't going to fix the white count before they come up. It is completely unreasonable to expect a field stick to be changed if it is working. It seems like anything the ED nurse missed was nothing you didn't find out quickly, and.nothing that would have really changed the course of events. The team already knew he needed to be in the unit and didn't put him there anyway....now THAT'S dropping the ball. I'm not sure why you didn't call the doctor for clarification of orders....that would have been entirely more appropriate. Man, when I think the ED dropped the ball it's usually because they "forgot" about the patient being a demon seed and on a 1:1 downstairs. They can't do everything. And what am i, chopped liver completely incapable of doing anything on my own? Gotcha. Stuff like this gets better with time. Cluster all care. Cluster all charting as much as possible. You'll get a routine. It just takes practice. As for the people who grill you about irrelevant things...you learn how to tune them out. 99% of the time they just want to hear their own voice. As for knowing what different procedures are, you'll pick that up over time too. It's overwhelming but you can't expect yourself to know it all. Time and exposure. Q4 assessments on the floor? Really? Why? I'm a little confused as to why your patients are on the floor if the acuity requires that much assessment? Also....delegate. It does not take an RN to feed a patient. Do your neuro checks and vital signs while you're in the room helping the patient. Document the neuro check quickly before you leave the room. Do your aides not chart i&o? It depends what is getting passed on. People forget that this is a 24 hour job and sometimes, not everything can get done. I for one hate the whining. Unless you're handing off to me 100 stat labs/a pt that hasn't voided in 10 hours because you didn't feel like straight cathing/never got around to hanging that blood (yep, that happened) etc etc....I'll probably handle it just fine. People who whine about simple dressing changes that take My unit has a list of specific things that are divided by day/night responsibilities, such as PICC dressings, chest tube dressings, new IVs. It works out really well and almost everyone sticks to it. Easier to get orders. Easier to get them to assess a patient. Not having to hear "this can wait for dayshift" when it can't. I guess I'm referring to a different kind of burden that isn't just tasking. And I do both too. I get it. Clearly my original point was over interpreted/not salient enough for the Internet. You're seriously splitting hairs here.